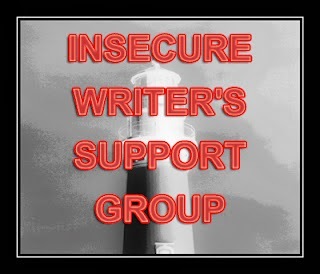 It's the first Wednesday of the month, which means it's time for the Insecure Writer's Support Group, hosted by Ninja Captain Alex J. Cavanaugh. The group offers a place for writers of all kinds to support each other in moments of insecurity. I realized early on that if I keep posting about my own frustrations and insecurities when it comes to writing, these posts are going to start sounding very similar. So last month, I decided to move away from "woe is me" and focus on motivation and encouragement. With all of my IWSG entries going forward, I'll be offering an inspirational quote from someone I admire. There's not much room for interpretation with this one. Like much of Asimov's work, it's straight to the point and the message is clear: don't give up. Even in the face of repeated and monumental failure, even when it seems like the only fruit of your labor is cold, hard rejection, don't give up. And outside of, "Just write the damned thing," I'm not sure I've ever heard a bit of advice more universally applicable for writers of all shapes, sizes, and shelves. You will never succeed if you aren't willing to persist. The road to publication is paved with rejection and criticism, so steel yourself before you drive it or you won't get very far. Thicken that skin, lace up your body armor, and plow head-first into the thick of your fears. Let failure roll off your back like water on a mallard's hide. Hell, why not go one better? Treasure your failures. Keep every rejection letter you receive, not to remind yourself that you fell short, but as a token of your continued persistence. Every time you read the words "not quite for us," remember that you're the member of a select group of writers who got off their butts and conquered the fear of failure, one submission at a time. When acceptance finally comes (and it will, if you keep trying), you'll get to have yourself a celebratory bonfire if you'd like. Me, I'm keeping mine. If I grow up to be a big famous author one day, I might even publish them. I think I'll call the book Persist, and dedicate it to the memory of Isaac Asimov. Happy Independence Day. Welcome to Urf. What a fantastic quote, I maye have to print it out to put up on my wall. And so true. And Stephen King has kept all of his rejection letters too. It's brilliant motivation to improve. That's not a bad idea! And you're right, that pile of rejections that sits on top of my printer is definitely motivating, especially when I compare it to the meager "stack" of acceptances. Every time I add an R, it just makes me want to write more. Me too, Vero. And it works! Self-defeatism never helped anyone, but converting despair into determination is healthy for just about everyone in the creative world. You're very welcome--and it's true! You might occasionally hear the phrase "everyone gets rejected" tossed about, but it's just not true. Only those willing to put a piece of themselves on a stranger's desk get rejected, and that's a commendable step in itself. Keep at it, justbishop. Thanks for stopping by! What a great quote, thank you for sharing it with us! Glad I could be of service, VikLit. Every rejection is just one closer to acceptance! J.W.--thanks for dropping over at my place. Unfortunately, time is tight for me right now and I'm focusing on short stories, so that's mostly what I'm reading at the moment. Thanks for the offer though, Mac! This is a good quote, thanks for sharing. Definitely give them a read; that sounds like a great find. I'd recommend the Foundation series, though you might want to throw in the Robot series for good measure, considering how influential it was. Thanks for stopping by, magic mint! I kind of like "Just write the damn thing." Goes well with the t-shirt I'm wearing today, " Even if it's crap, just get it on the page." It does! That's great advice as well. This post oddly reminds me of a story I once heard somewhere about Spencer Tracy. He was very, very deeply committed actor and made every scene look honest and natural. One day Spencer is shooting a scene with this kid who is worried, stressed, and over-analyzing everything. He's holding up production with all of his hesitations. "What's my motive behind coming through the door?" he asked the director. Spencer got so frustrated that he replied, "You go through the damn door because it is the only way to get in the damn room!" I think his comment goes with what you're saying. Just be honest to yourself and get it done. Nice! I like that quote. And absolutely, you're right. Sometimes when you talk about persistence, people the get the wrong impression and think that it means you must plug your fingers in your ears and ignore rejection, but that's not the case. Honest persistence is the way to go. Glad I could be of service, Katharina! Thanks, Lexa! Glad I could encourage you. Good luck querying! J.W. thanks for visiting my blog and that is indeed a great comment. Thanks for sharing it with us. Yes, I was thinking along the same lines as you, it is time for positive outlooks and not to focus on negatives continually! Absolutely. Positivity is more productive! Thanks for reading, C.M..